The Slow Carb Diet is a great template for fat loss and the Paleo diet is a great template for health. Sometimes it can get confusing navigating through what and when to eat, or you can follow it perfectly but your results are less than expected. I’ve combined over 10 years of education and thousands of hours of research with my experience working with hundreds of patients in my clinic – patients with problems and goals just like yours – and I’ve turned it all into a practical, easy-to-follow system that allows you to personalize your diet, create custom meal plans, and get all the support you’ll need to make it work for you. And I’ve done this with a level of passion and commitment that only someone who has had their own personal success story can do. What is the result of all this work? The Personal Paleo Code will help you move from confusion and uncertainty about nutrition to clarity and confidence. You’ll find that I’ve been able to simplify the process of starting the diet and transitioning into it with tools like menus, food lists, recipes, charts, cheat sheets, reference guides, and more. Who is Chris? What does he know? And why should you listen to him? I first heard of Chris when he was a guest on Robb Wolf’s podcast, he was promoting his product “The Healthy Baby Code” that he created out of many presentations that he gave about nutrition for conception and growth of a baby. I have a young son so I was very interested in this topic and from that interview I learned a lot. I also started to read more of what Chris was writing and listening to his podcasts, and can not believe the amount of knowledge that he has on nutrition and health. Here is what he says about him self. I’m Chris Kresser, a practitioner of integrative medicine, creator of the popular online health resource, ChrisKresser.com, and creator of the former Healthy Skeptic blog. In my early 20s, after completing my undergraduate work at UC Berkley, I took off to see the world. While traveling in Indonesia, I got very sick with a tropical illness. After seeing numerous doctors with no results, I realized I would have to take matters into my own hands. This initiated a multi-year quest to heal myself by studying integrative medicine and diving deeply into scientific research. I later graduated from the Acupuncture and Integrative Medicine College in Berkeley, CA and now have a private practice there. I also consult with patients nationally and internationally via telephone and Skype. In my practice, I focus on helping patients who are motivated to play an active role in their own healing process and who are willing to make the necessary dietary and lifestyle changes to support health and well-being. I then use nutritional therapy, herbal medicine, supplements, stress management, and lifestyle changes to restore proper function. I practice Functional Medicine, which is investigative, holistic, preventative and evidence-based. If you’re like most of my patients, you’ve tried a lot of diets over the years to try to feel better or lose weight, to boost your energy or improve your health. Some of them failed, some did nothing at all, and some even worked – at least for a little while. Or maybe they solved some problems (being overweight) but caused others (low energy, hair loss, cold hands and feet). The dietary recommendations are personalized for each individual patient. Nutrition always plays a key role in recovery and success. Having support and guidance along the way makes a huge difference. This is like hitting the reset button on your body. You return to the basic human genetic template by removing the foods we’re not adapted to eat and/or those that most commonly cause problems. Once you’ve given your body a chance to restore itself, you reintroduce some of the foods you removed in Step 1 to see if they work for you. In this step you fine-tune and personalize your diet right down to the macronutrient ratios, meal frequency, and tweaks for weight loss, thyroid and blood sugar problems, autoimmune disease and more. What you will end up with is a diet that is personalized exactly for you – a diet that is comprised of foods and guidelines based on your own experience and your own experimentation. You’ll have the solid foundation of a time tested, genetically sound, and scientifically proven philosophy, but with the added personalization that really makes it fit your body, your goals and your life. Changing habits, changing the way you shop, cook and eat can be challenging and time consuming. So, this program also includes tools and support to help make that transition as smooth as possible for you. We focus not only on personalizing the diet, but on helping you fit that diet into your lifestyle. Personalized Recipes, meal plans, cheat sheets, guides, worksheets, and shopping lists, and more, make it easy to stick to your personal plan. Based on my experience in the clinic and thousands of hours of research, I’ve designed a program just for you. You get lifetime access to a full online arsenal of information, resources, support, tracking tools, and more for a single payment. Track changes to weight, energy, mood, pain and more with the click of a mouse in just a couple minutes per day. It’s not just about weight, but overall wellness. Seeing your progress over time not only helps you stick with the program, but is key to making the changes that truly personalize the program for you. For a limited time, everyone who signs up for the Personal Paleo Code program from this webpage, will also get a 30-day free trial of the Personal Paleo Code Meal Plan Generator. Search over 425 recipes – with more added every week..
Save your favorite recipes for easy access. Generate meal plans based on common approaches, like low-carb, strict Paleo, GAPS, and more. List recipes for special categories of foods like ferments, sauces, condiments, dressings. It is more than a just meal plan generator – it’s an interactive Paleo cookbook on steroids. Use the Selection page to indicate which foods you are currently including or avoiding. Simply click the button to generate your custom meal plans and personalized recipes. Or, generate a quick meal-plan based on pre-configured criteria like ‘very low-carb’ or ‘strict paleo’ – get a full week, custom meal plan, recipes and a shopping list with one click – so easy and still customized to your needs. Just a quick post about a meal I cooked up a while ago from the Paleo Recipe Book. I combined and altered a couple recipes, the liver and bacon on page 266 and the coconut breaded chicken on page 85. The lipid hypothesis was one of two hypotheses (the other being the chronic endothelial injury hypothesis) developed in the 1850s to explain the pathogenesis of atherosclerosis. It proposes a connection between plasma cholesterol level and the development of coronary heart disease. Note: The connection between dietary cholesterol and serum (blood) cholesterol is also strongly related to this hypothesis, but is a separate and distinct hypothesis. The science that was used to ‘prove’ the lipid hypothesis has been proven to be faulty. Rabbits were fed cholesterol from animal products, which, is not part of a normal diet for rabbits. The results were not the same using dogs and rats. There also is many studys that show low cholesterol is actually associated to a higher overall morbidity rate . And that most people admitted to hospital for heart attacks don’t have high cholesterol . The immediate assumption from doctors is then, ‘… the current guidelines may not be low enough …’ which to me is illogical and short sighted. Not only is cholesterol show to be not a good marker but calculating the so called bad (LDL) cholesterol is a estimated calculation not a measured test . It is also important to understand what cholesterol is, what it is used for, and why it is a ‘good’ thing to have in the right context. It is an essential structural component of mammalian cell membranes and is required to establish proper membrane permeability and fluidity. In addition, cholesterol is an important component for the manufacture of bile acids, steroid hormones, and vitamin D.
Why is the lipid hypothesis still thought to be true in North America? Well 1) Politicians with no scientific background wrote dietary guidelines based off Ancel Keys bad science in 1977 2)Pharmaceutical companies make a lot of money selling cholesterol lowering drugs (statins) that work in the sense they lower your cholesterol, but don’t work because lowering cholesterol does not solve the actual cause of poor health. But isn’t cholesterol bad for you? This belief is based on the Lipid Hypothesis of cardiac health (cholesterol = bad), which I disagree with based on the sum of total available evidence. Between 2006 and 2009, I had obsessed over lower my total cholesterol. The outcome? Lower testosterone and fatigue. I’ll take my egg yolks, thank you very much. I had gained 34 pounds of muscle, lost 4 pound of fat, and decreased my total cholesterol from 222 to 147, all in 28 days, without the use of any anabolics or statins like Lipitor. Then later in “Slow Carb Diet Part I” chapter. Also in this chapter Tim measures his cholesterol with the “fructose experiment” at the end of the chapter. In it he states that after 7 days of 14 oz of pulp free orange juice upon waking and before bed his total cholesterol went from 203 to 243 and his LDL went from 127 to 165 (which we now know is just a calculation using total cholesterol). These have me confused and seem like contradictions to me. My first guess is that they were written at different time periods and the stats about lower cholesterol were during 2006 to 2009 when he was “obsessed with lowering his cholesterol”. It would have been nice if he mentioned that some where though. In regards to differentiating between organic egg yolks and commercially farmed eggs. I must agree that the yolk of commercial egg vs an organic (or omega 3) egg is completely different in look and nutrition. The organic version most likely being much more nutritionally dense. I was unable to find any numbers or nutritional comparison of the two. 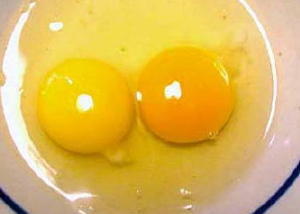 In my opinion there is nothing that bad in the yolk of a commercially produced egg and no reason to avoid it. As Tim also says, “pay the six pack tax” and get better quality eggs. Anitschkow NN, Chatalov S (1913). “Über experimentelle Cholesterinsteatose und ihre Bedeutung für die Entstehung einiger pathologischer Prozesse”. Zentralbl Allg Pathol 24: 1–9. Anitschkow NN (1913). “Über die Veränderungen der Kaninchenaorta bei experimenteller Cholesterinsteatose”. Beitr Pathol Anat 56: 379–404. Duff GL, McMillian GC (1951). “Pathology of atherosclerosis”. Am J Med 11 (1): 92–108.doi:10.1016/0002-9343(51)90011-3. PMID 14837929. The 4-Hour Body and the Slow Carb Diet have changed a lot of people’s lives, just like Tim’s first book the 4-Hour Work Week. His next book is a great follow up to the 4-Hour Body and is titled The 4-Hour Chef. I don’t think this book will be as life changing as the first two, but for all you ladies out there who can’t get their significant other into the kitchen to cook, this is the book to that will change that. The book is no on pre-order here but the best part is Tim is personally answer questions to promote his new book, just scroll down on the pre-order page to the ‘More About The Author’ section. Here is a YouTube videos that Tim has already publish to get the marketing for the book started. Are you going to pre-order the book? Do you think it is a good topic that Tim choose for this book? Do you think it will be a NYT best seller like the rest? Think having amazon be the publisher is a good idea? Let us know what you think. Update: There is a trial offer for $5 which makes this very affordable ebook. You will be billed the remainder in 21 days but you do get a lot of good info. The author Mike Geary is just personal trainer, but he does have many years of real experience helping people. I was hoping for a really simple easy to follow program that laid everything out for you, but after reading the whole book it is much more than that. The book reads like a really long blog post, it is pretty informal. I am not sure if I like or dislike that but it is pretty easy to read. It would be tough to read the whole thing at once it is 152 pages long. It is broken down into sections, so that is how I will review it, but there is no table of contents which is kinda odd to me. In the preface he tries to answer some common questions and get them taken care of right away. He states his methods are unconventional (similar to Tim and the 4HB), but to trust him that they work which he proves by using the thousands of people that he has helped. He also emphasizes the book is meant to be read start to finish, unlike the “Choose your own adventure” that The 4HB is. For any women reading it he acknowledges there is little difference between the program for men vs women. The program is made for people with or without a gym. There are some ads for adjustable dumbbells and stability balls for people that want to workout at home and do more than just bodyweight exercises. Not much covered here, just some basic stats and some other generic info. He discuss that ab exercises won’t get you a six pack unless you have a low body fat percentage. No news here for us that read The 4HB. Here he gets into some motivation. This is probably the most overlooked part of any diet and fitness book. You could make the assumption that because people already bought the book they are some what motivated. But staying motivated, that is that hard part. I think he has done a good job here, but it is hard to rival the motivation that Tim provides in the 4HB and The 4HWW. This section is an obvious overlap with the Slow Carb diet from the 4HB. He does a really good job of explaining the good and bad of insulin, carbs et al. I really like how he emphasizes how bad grains are, and he even mentions “Paleo”. I really like this section and how he emphasizes food quality and not macronutrient break down. That being said, some people may have faster results if they keep their carbs down initially, but we know long term that food quality is much more important. Another good section full of things that took me a many months of books, websites and podcasts to learn. The importance of dietary fat, and what is good and bad fat. He includes some links to US Wellness Meats, which I have not yet purchase from but will soon. There are some discussion of omega-3 and omega-6 ratio. He seems to prefer krill oil, but I still like the more natural fermented cod liver oil. Just more discussion on eating REAL food. This is an interesting way of describing a cheat day or a refeed. He discuss leptin and starvation mode. Not sure on his science here but a re-feed is an important concept. I always suggest keeping cheat days gluten free. This part, unfortunately, he is just flat wrong. This has been proven multiple times in clinical trials, as well as by many people that follow Martin Berkhan’s protocol on http://leangains.com. Some interesting discussion on high fructose corn syrup and trans fat. Nothing new really but still very important information. This is an investing topic that is new to me. I have not read much on the relationship between calcium and body fat. I am not sure if this is just a correlation thing or if there is any biochemistry that supports this. I do like that he emphasizes raw milk and its benefits, unfortunately I live in Canada where it is outlawed. I do wish that he emphasized other sources of calcium more instead of just a small note at the end. He also misses some important things like absorption and vitamin D, as well as acid base balance and how it affects calcium. No secret here for us 4HB folk and those of use that have had great success with PAGG. This one was new to me, and I am going to purposely leave this out of my review, don’t want to give all his secrets away. Our good friend soy. And to think that I used to believe the BS that soy was good for you. Another great chapter that reveals some seriously wrong myths in today’s health food industry. This is a good summary of what to do if you want to skip all the why, but I recommend agains that. Here is a pretty big list of meal ideas with full macronutrient breakdowns. Really useful and makes it really easy. I am not going to discuss each section of this topic, as I agree with Mike that exercises, especially ab exercises, are pretty useless. He starts with some anatomy which is good. Then describes the optimal position to be in, some over lap here with The 4HB six minute ab chapter. Then he recommends some exercises and has some pictures of him doing them, with detail explanations of how to perform them. Next he lays out a full program at different difficulty levels. Again I am grouping a bunch of sections together, because we know that exercise is not as important. Mike begins by discussing Resting Metabolic Rate (RMR), which is better know to us as Basal Metabolic Rate. More lean mass the higher your RMR. He discusses the differences between isolation exercises and multi-joint movements. One thing that he does mention, but does not discuss is testosterone and the endocrinology involved in full body exercises. He has a good discussion on rest and training frequency. Although he suggests 45-60 minute workouts which use 4HB people know is not necessary. There is a long discussion on cardio and HIIT, and I am a big fan of HIIT. These tips are all very good, so good that I would have give them more emphasis. I have discussed previously how big of an impact cortisol can have on fat loss, and I think for some people this is the single biggest factor. Here he lists the same content from the entire book into a question and answer form. From what I have learned getting to single digit body fat, I have no doubts that if you follow Mike’s guide you will be able to have a size pack. I was surprised at the amount of good science that he has in his ebook that contradicts conventional health and fitness (although there are a couple minor things missing and wrong). Although it is not the same type of book as The 4-Hour Body, I think that its format makes it much easier to follow, and is easy to adapt to each fitness level. I do recommend it but I do think the price is pretty steep, unless you choose the $5 trial offer. If you have read “The Truth About Six Pack Abs” what did you think? Did you have success following it? Mike also has a lot of good free info on his blog take a look at some of these articles. Are you buying “toxic fish” at the grocery store? Shortly after the book came out Tim released some material that did not make the final cut here. One of the bonus chapters was a guest chapter written by Seth Roberts, author of The Shangri-La Diet: No Hunger, Eat Anything, Weight-Loss Plan. The chapter is title An Alternative to Dieting: The Bodyfat Set Point and Tricking the Hypothalamus. After the first time I read it I did not try it right away. Then I started reading Stephan Guyenet’s blog and his hypothesis on obesity is based solely on leptin … what !?! So I figured I would give it a try. I had kinda stalled out around 12% body fat and was happy with that but still wanted to cut down, so I did a teaspoon of olive oil in the morning and whenever else I remembered to, which was usually 1-2 times a day. I didn’t not follow the exact method of having it between ever meal. Then the whole Gary Tabues VS Stephan Guyenet fight at the Ancestra Health Symposium happened. I had already listened to the audio book for Taubes book Why We Get Fat so I started reading all the stuff on leptin that I could to see what Guyenet has to say and I re-read the bonus chapter to see how Roberts’ stuff relates to Guyenet’s. So from my n=1 experiment what was the conclusion? It works, actually it works so well it is kinda scary. I am never hungry, I never get hunger pangs … never. I have to remind myself to eat when lunch time rolls around. I rarely snack on almonds but more out of boredom than anything. Actually boredom (or working on something that I didn’t want to be working on) was when I would get most of my cravings, that has totally changed now. And what about my body fat? Well you can see from my last photos how much more I have leaned out, and I have stayed the same weight or gained about a pound. What does this mean? I think there is some merit to the flavor energy (calorie) connection and how that controls appetite. How that controls body fat I still don’t quite get. Do I think it is the cause for our energy imbalance (excess fat), not completely, insulin still plays a large role in that. Is it the cause of us over eating, binge eating, having cravings? Yes I am pretty sure that it is for most people. I also think this explains a few things about “diets” in general and diets that are more bland may be more successful at fat loss. It also explains a lot about artificial sweeteners and the high flavour with zero calories will really confuse our Endocrine glands. If anyone has tried this please let me know in the comments. If anyone is trying to get through a plateau I highly recommend giving this a try.